the relation between permutation and combination. Permutation is the number of ways, in which you can choose r elements out of a set containing n distinct objects. The order of choosing the elements is important. For example, imagine that you have a deck of nine cards with digits from 1 to 9. You draw three random cards and line them up on the table, creating a three-digit number. How many distinct numbers can you create? The exclamation mark represents a factorial. Check out our factorial calculator for more information on this topic. You can notice that according to the permutation formula, the number of permutations for choosing one element is simply n. On the other hand, if you have to choose all elements, the formula gets reduced to P(n,n)=n!. You can check the result with our nPr calculator. If you switch on the advanced mode, you will be able to find the number of combinations as well. Combinations are also ways to choose r out of n elements. Unlike in permutations, the order in combinations doesn't matter. For example, imagine a bag filled with twelve balls, each one of a different color. You pick five balls at random. How many distinct sets of balls can you get? C(n,r) = P(n,r)/P(r,r) = P(n,r)/r! Make sure to try our probability calculator if you are interested in probability problems. 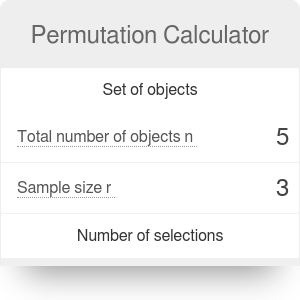 Permutation Calculator can be embedded on your website to enrich the content you wrote and make it easier for your visitors to understand your message.